Not long after the C5 Aircross was revealed, Citroën is stepping up its offensive in the SUV segment with the New C3 Aircross - its new-generation compact SUV with an assertive personality. Citroën says that its unique body styling and its generous forms lend it a powerful and fresh attitude, as well as a personality strengthened by extensive personalisation possibilities, with 90 exterior combinations and five interior design scheme choices. Inspired by customers' expectations, this people-minded SUV features unrivalled spaciousness and modular design and is reaching outwards thanks to its opening panoramic glass sunroof. As ambassador of their 'Advanced Comfort' programme, Citroën claim that the C3 Aircross brings total wellbeing on board and an extraordinary at-the-wheel experience. It adds that it is equally at ease in the city and out on the open road. The new model's adventurous abilities have been enhanced with the Grip Control and Hill Assist Descent systems. And Citroën says that it is also equipped with modern technologies, including 12 driver assistance systems such as the head-up display and four connectivity technologies such as wireless charging for smartphone. The new Citroën C3 Aircross Compact SUV will be launched in Europe in the second half of 2017 then rolled out internationally. 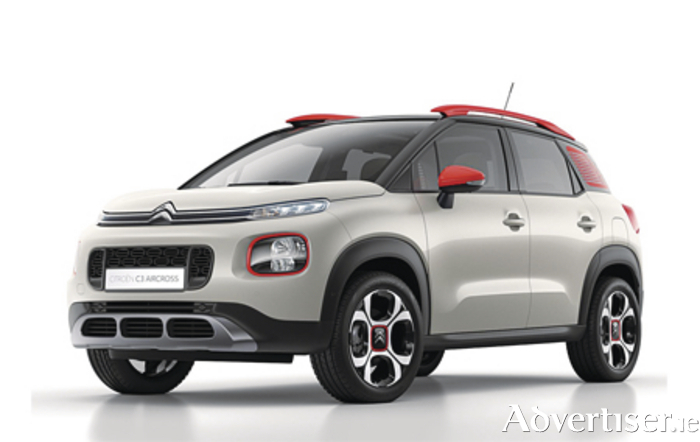 Call Hugo Loonam Motors on (090 ) 6457104 for more information or call into the showroom in Cloghan to view the full range of Citroën vehicles available. Page generated in 0.0883 seconds.